Here we are. Just a few months away from Kindergarten. Where did the time go? Another big “first” and one that I’m not quite ready to think about, yet it will be here before we know it. For the first time, I’m looking at the Kindergarten experience as both an educator and an anxious mom. 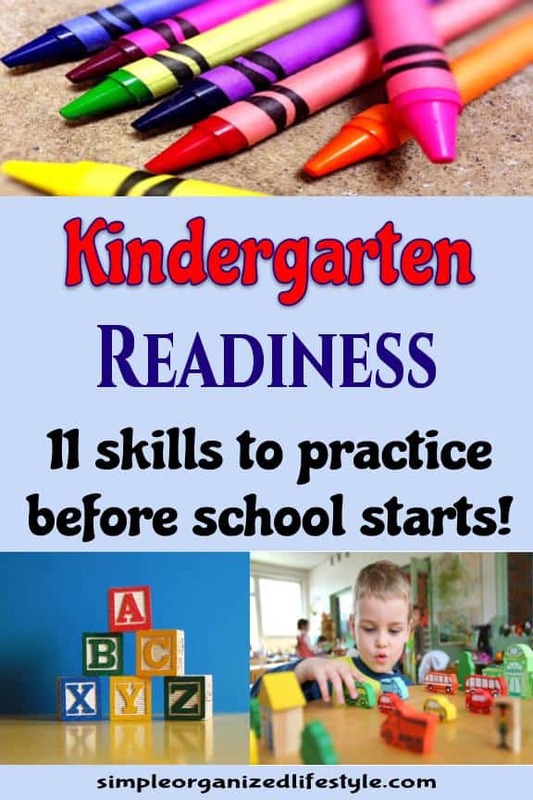 I’ve learned through the years that there are 11 skills children need to master before Kindergarten. These skills are not required by any means since all kids reach milestones at different times and levels. However, they do help set up children for a smooth start to their educational journey. 1. Using the bathroom without help. Kids at this age are expected to use the bathroom without any help at school. If you think about it, that’s a lot of steps to remember from zipping to flushing to hand washing! Parents can work on this at home by letting kids do everything by themselves with reminders and praise. You could even write down some simple steps on the bathroom mirror with a dry erase marker. Wearing clothing with elastic waists or easy snaps will help young kids as they learn the new routines. 2. Recognizing their full name, address and phone number. Kindergarten students will see their names everywhere… on their seats or tables, on charts, on cubby hooks, on the birthday wall, etc. They need to be able to quickly pick out their name and respond when called. It’s also important for them to learn their address and phone number, especially if they will be riding the bus. The easiest way to teach these are through repetition or coming up with a catchy rhyme or song. 3. Recognizing letters of the alphabet, basic colors and shapes, and counts to 10. 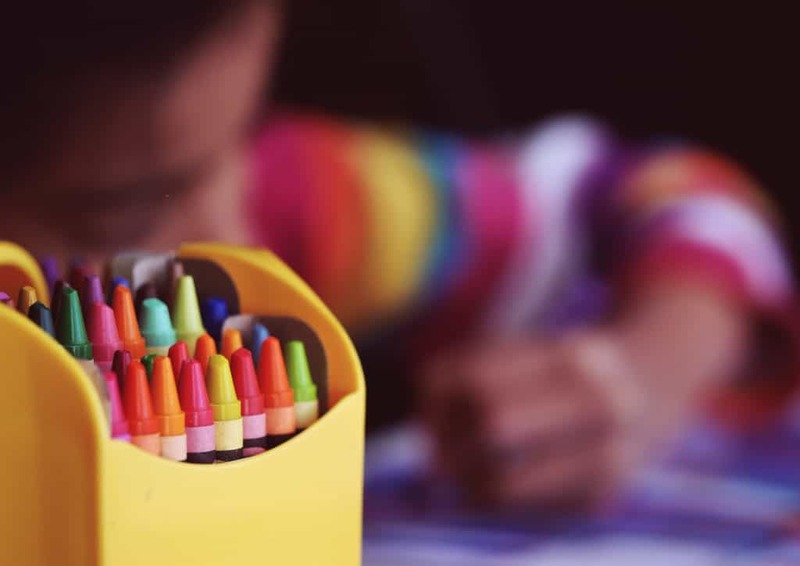 Knowing the letters of the alphabet, basic colors, basic shapes, and being able to count to 10 will give your child some confidence those first few weeks of school. Kindergarten curriculum moves well beyond the basics at a pretty fast pace. Kids will leave their first year of school reading, writing and doing simple addition and subtraction. I have an article about some quality free educational websites for preschoolers that can help with practicing these basic skills. 4. Using pencils, crayons and scissors. Kindergarten kids will be doing a lot of writing and coloring. If they struggle with writing or their grip, try adding a pencil grip or letting them use triangle shaped crayons for practice. Kindergarten students will also frequently be using scissors. Scissors take some time and effort. Let your child practice at home by cutting on a dotted line with the pair of scissors that you will be sending to school. 5. Putting on and taking off coats/backpacks without help. Kindergartners should wear clothing that they can easily put on and zip/button by themselves. This helps build independence and reduces frustration. They also need to be able to zip and unzip their backpack and open and close any special latches. This is something they could practice at home by using their school backpack when you take a trip or they spend the night with grandparents. Another tip is to use the same pencil pouch all year for sending money to school… money is sent throughout the year for things like lunch, snacks, field trips, pictures, fund raisers and so forth. This helps your child learn where he or she should look when money is sent to school for special things. Kids will hear a lot of simple directions throughout the day. If you can use some of the same simple directions at home (even if it doesn’t seem natural) it will help them at school. Bring me your (notebook, paper, work). Come sit on the rug. 7. Using words to express feelings. Your child needs to be able to say “I’m (sad, mad, happy, scared) because (this happened) and I want (that instead).” Some children excel at this and others, like my own, struggle to find the right words for emotions and feelings. The best thing you can do at home is to let them talk as much as possible to get these feelings out. Acknowledge and help them come up with a solution. It might require a little bit of compromise (clean up first, then one tv show) but the goal is to get them to talk/work out emotions rather than act out. 8. Fixing their food independently. An elementary school cafeteria is an experience in itself. There are adults there to assist children but it’s busy and it’s loud so it could take awhile for your child to get assistance. They will get the hang of things like carrying a tray and opening a milk container with some practice. Look for opportunities at home or restaurants to remind them to get a napkin and fork, let them put straws in their juice box and practice opening ketchup packets. Another option is a bento box. This reduces the steps to just opening one container that holds all of their lunch items. Ours is pictured below and this is the exact one on Amazon. 9. Jumping, skipping, throwing, catching, and kicking a ball. These skills will help Kindergarten students when it comes to physical education and playing different games. These are fun activities that can be enjoyed at home or school. Social skills. They are so critical, yet it’s hard for them to work out all their little five year old “problems” in a class full of unique personalities. You have my child who gets upset when he doesn’t win, another child who doesn’t want to participate, another who has to be first and so forth. One thing you can do with your child is use social stories. Social stories are things you can make up or talk about from stories or characters they know. Kids are listening and will remember these conversations when they face similar situations with their friends at school. 11. Understanding basic elements of print. I go into detail on these skills in this article about 5 simple tips to boost your preschooler’s learning. Understanding basic elements of print, such as reading from left to right and top to bottom will ensure children are familiar with how books and print works. Don’t worry if there are some of these areas where your child is not quite ready! Kids develop at all different levels and sometimes being around other kids their age will help as they teach and learn from one another. This is an exciting, special time for kids and parents. Talk it up and get ready to watch them learn and grow so much! I’m right there with all the moms getting ready for this big change in a few months and had some moments of holding back tears just writing this. However, I’ve seen the other side and our babies are going to be just fine in the care of some awesome teachers… Kindergarten, here we come!